Find hard to locate sizes in a beautiful decorative floor or wall grill. If you don't need to control the air flow here are the grills for you. 15 Finishes to choose from you are sure to find just what you want. Need a size not listed these grills are fully customizable. Just call for pricing. Checkout 100's of options for floor and wall registers. Fully adjustable dampers to control air flow. Decorative styles and finishes that you have been looking for. Spruce up your floors or walls and really make people take notice. Finally! Round decorative return air grilles for wall AND floor use. Find 5 sizes in this circular vent cover and many design/finish choices. Round custom vent cover sizes available too! 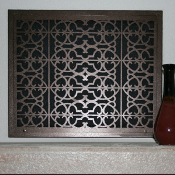 Decorative filter grilles in many different designs and finishes available. Replace your damaged existing filter grilles with these decorative filter grilles today!